They seem to have kept up the Wetherspoon tradition of understaffing the bar as I had a bit of a wait to get served but the barman was pretty diligent in serving people in the correct order. Went for the Braxator which was a nice enough pint. The have some shiny brewing equipment in the bar and even though it is basically unchanged from the Wetherspoon layout they manage to dispel the feel of a Wetherspoons. Was best beer of the night. 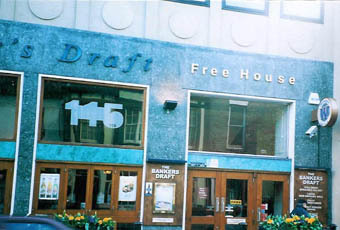 This old Wetherspoon's pub is now a Brewhouse & Kitchen, brewing its own beers on the premises. Their regular ales are Banker's Draught, Intrepid & Invarsity. There is also a changing beer, which was Braxator. Orchard Pig Maverick was also on tap. Food is promoted and it is family friendly. There is an outdoor area at the rear. Not sure if the CAMRA discount is offered on cider. But I forgot to ask in any case. Has now been closed down and sold off in line with 'Spoons current cost-cutting measures. If one of the two of their pubs in the town was to go, I would have said that the Pilgrims would be the one. Not quite sure what their reasoning is, but there you go. This will now be a craft beer emporium by the sounds of it, which I'll dutifully give a try as and when it re-opens. Slightly better than it's other Wetherspoons counterpart in town The Pilgrims Progress, probably because that is nearer the bus station and the smelly old men / unemployed / drunks don't like to walk far when they get off the bus. There are still a few characters in here but less so than many Wetherspoons I have been in. The food is standard Wetherspoons fayre and beer quality is good but as with many of these pubs the staffing let the place down - I have stood at the bar for many minutes whilst members of staff mess around / gossip / play on their phones at the other end of the bar oblivious to the fact that customers are waiting. Even a loud cough or clinking glasses together doesn't rouse them from their posting of ironic statuses on Facebook and the like. I have also sat near the kitchen on more than one occasion and heard blazing rows between two or more staff members! So choose your seat carefully! Generally this pub is comfortably busy but you can usually always find a seat. As is often the case though, there are many better pubs in the locality. 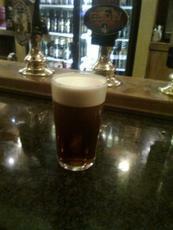 Food is to Whetherspoons standard and has some interesting ales to try. Service good.